1. 100 copies of synthetic tandem repeat ("synTR"). 2. 10 copies of epitope tag as TALE-(linker-epitope)10 ... see new page 48 (e-poster page 10) for coiled coil domains. 3. 10x brighter green FP by binder-(linker-bfloGFPa1)3. 100 x 10 x 10 = 10,000 times brighter than a single EGFP molecule. genome, such as MUC1 (see Kirby ... Lander 2013 Nat Genet, for sequences), MUC4, telomerase, and more. * TALE or Cas9 ... see also Tanenbaum 2014 "SunTags" paper, with 24 (early part) or 10 (later) epitope tags per Cas9. * 10x brighter GFP than the 'standard of care' EGFP from 1996 (is anyone reading this still driving a 1996 minivan?). Chemistry) -- could make TALE-(linker-Coiled coil B)10 that would pair with TWO Coiled coil A-(linker-FP)n.
I posted the Tattletales and T-Bow concept online is October 23, 2012 as public domain -- see http://home.earthlink.net/~pubspectra/McNamara_20121023Tue_Tattletales_GFP_Public_Domain.jpg (also included in the PDF here, before the new 10 pages). 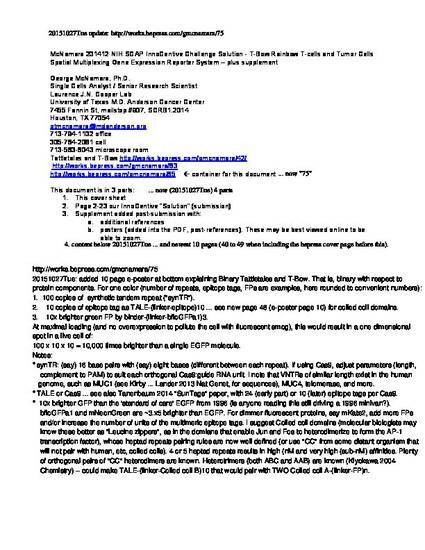 This page is http://works.bepress.com/gmcnamara/75 The download is a PDF, updated October 27, 2015 (20151027).